Frederick Law Olmsted (1822-1903) is recognized as the founder of American landscape architecture and the nation’s foremost park maker. 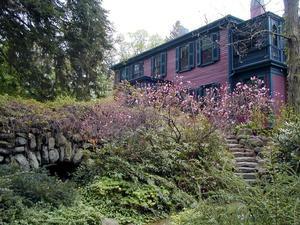 Olmsted moved his home to suburban Boston in 1883 and established the world’s first full-scale professional office for the practice of landscape design. During the next century, his sons and successors perpetuated Olmsted’s design ideals, philosophy, and influence. Olmsted is best known as the creator of major urban parks, but across the nation, from the green spaces that help define our towns and cities, to suburban life, to protected wilderness areas, he left the imprint of his fertile mind and boundless energy. Out of his deep love for the land and his social commitment he fathered the profession of landscape architecture in America. Olmsted’s unique contributions stemmed in part from the conjunction of strongly felt personal values and the needs of a young nation. America was experiencing unprecedented growth in the mid-19th century, making the transition from a rural people to a complex urban society. City life became more stressful as the crowds grew, the pace quickened, and the countryside was pushed into the distance. Olmsted and others saw the need for preserving green and open spaces where people could escape city pressures, places that nourished body and spirit. His intuitive understanding of the historical changes he was living through and his rare combination of idealism, artistry, intelligence, and practical knowledge enabled him to help soften the shocks of industrialization. Unable to separate his love and respect for the land from his belief in democracy, Olmsted saw parks as bastions of the democratic ideals of community and equality. He confronted a period of rapid mechanization and unabashed materialism with a natural sensibility and the old Jefferson virtues of restraint and rural simplicity, values still represented in his parks.